By David Veselka on Jun 7, 2013 - 31 Comments. To be 100% honest, I’m actually surprised I’m even able to review Crysis 3‘s first piece of downloadable multiplayer content in the first place, considering how hard it is to even find others who will play it with me. Crysis 3’s community is small – so small, that in the base game, the only viable game type is really Team Deathmatch. It’s the only playlist that will ever fill up enough to be able to provide some decent matches. It makes me wonder how EA or Crytek ever thought it would be a good idea to charge gamers for DLC, splitting the already miniscule community even further. Regardless, it’s out there, and it’s actually not that bad. The issue lies not within this tropical throw-back expansion, but within the base game itself. Therefore, I’ll be looking solely at this particular add-on and how it fares as a piece of DLC, not whether or not you should buy it or whether or not Crysis 3 is still relevant as an online multiplayer shooter. Should you choose to make the investment, however, here’s what you’re in for. 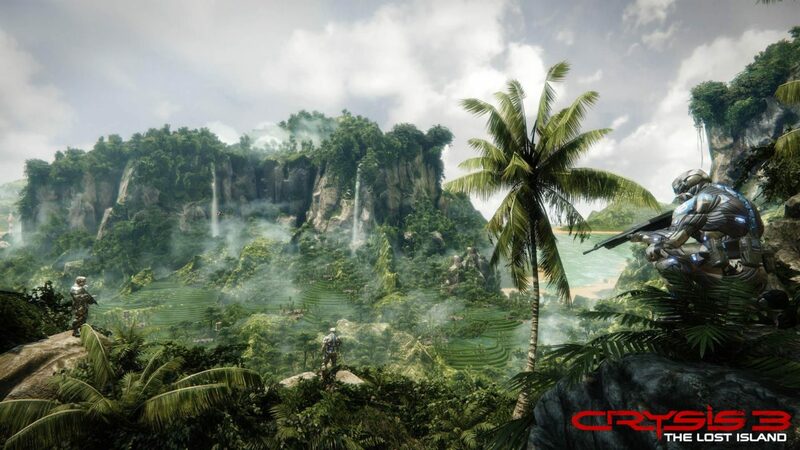 The Lost Island is basically a good excuse to show off some of the most iconic scenery that the Crysis series has become known for meshed with the gameplay of Crysis 3 and brought to life with the powerful CryENGINE 3. There is a lot of beauty to behold in the four new maps; Crossing, Coastline, Creek and Ascent. If you’ve spent a lot of time with the original Crysis, you’ll feel comforting bouts of nostalgia and familiarity. 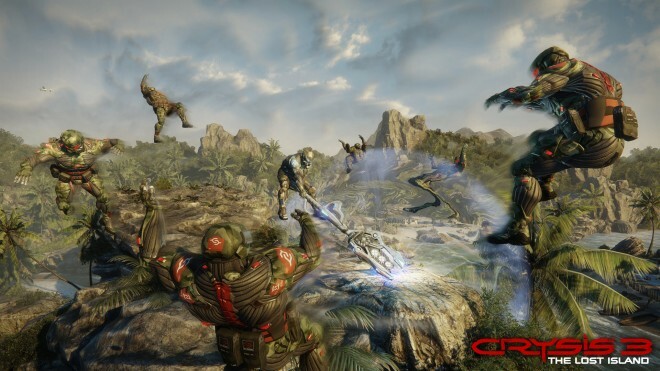 My biggest question is, if Crytek went this far to give a nod towards old-school Crysis players, why not take the approach of an old-school, open-world, sandbox-style gameplay and go the single player route? Who wouldn’t want to explore new areas of the Lingshan Islands as Prophet (or even Nomad, if he’s still alive) taking on the evolved Ceph baddies in a heavily modified Nanosuit? That is some Crysis 3 DLC I would gladly play $14.99 USD for. But, I digress. Multiplayer it is. 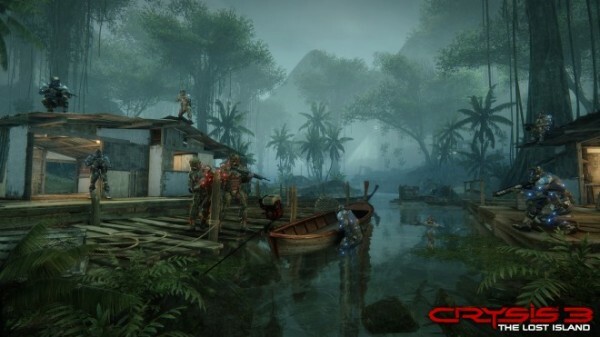 Crossing takes you back in time to your very first encounter with enemy nanosuit-wearing soldiers in the dark swamps of the Lingshan Islands of the first Crysis game. Crossing takes place in a dark, swampy wetlands while the contrasting Coastline boasts some of the most gorgeous, sunset-lit, tropical scenery I’ve ever seen in a multiplayer map. Creek sits in a small village high in the mountains while Ascent brings the fight to a more dense jungle environment. All four maps are actually pretty big. That doesn’t sound like it would make much sense for Crysis 3’s blazingly fast-paced gameplay, but we’ll get to how it’s handled properly when we start talking about game modes. Both Crossing and Coastline are fairly open in their layouts, allowing you to approach situations any which way you please, while Creek and Ascent feature more linear pathways. Together, all four maps offer a varying palette of colors, both visually and in terms of gameplay. Oh, and the random wildlife here and there is a nice touch. If you were to find yourself exploring each map in a solo private match (which I highly recommend you do at first), you’d most likely ask, ‘how would anyone ever find any action in such large areas?’ That’s where the two new game modes, Posession and Frenzy, come in. Possession tasks two teams with securing some sort of alien power source and holding on to it for as long as possible. The soldier who picks it up can wield it almost like a gravity hammer from the Halo series – swinging it around as a melee weapon or even throwing it at unsuspecting foes – or tuck it away in order to use more conventional weapons. Either way, should you possess it, you’ll move slower and must work with your teammates who will want to build a strong defensive perimeter around you. Of course, you’ll light up like a Christmas tree on the map, attracting all sorts of attention. If the device is left unattended for a certain period of time, it will reset to a new location which must be manually located again. The team who has collectively held on to it the longest wins. Frenzy is Crytek’s free-for-all take on a more familiar game mode. Every soldier is granted the very same weapon and loadout that cycles every 60 seconds. I haven’t been able to verify yet if the rotation is set or random, however. Either way, the more enemies you smite, the larger your XP multiplayer builds, as does the bounty on your head. Soldiers with large multiplayers show up on the map and become easily locatable, whether cloaked or not. Much like Possession, it’s a great way to focus firefights to particular areas that depends on the player, making it really easy to find action. My only gripe is that both modes seems to want to spawn you after death at the most far away location possible from all the action. While you’ll usually know exactly where to go to find others, it will probably take you a long while to get there. A friendly game of Posession on the beach. Along with a pair of new game modes, Crytek has also introduced two deadly new weapons. The Claw is a powerful lightweight assault weapon with a slow fire rate and some serious recoil. It also sounds really scary. The Rhino is a semi-automatic shotgun that fits somewhere in between the Jackal and Marshall, giving you a nice mix between the two. It, too, sounds really scary. Currently, I believe the Rhino is experiencing a bug that will often render the sensitivity of hip fire aim speed and ADS aim speed exactly the same. Basically, trying to steady the Rhino by aiming down sight will not steady it at all. At least, that’s what I’ve experienced on the Xbox 360. Anyways, I played a few rounds with each and, while I certainly thought them to be hip and cool at first, the effect quickly wore off and I found myself switching back to my preferred arsenal of weapons. What also struck me as odd was the sound design of both the Claw and the Rhino. They both seemed to be mixed differently than all of the other weapons in Crysis 3’s multiplayer. They sound good, that’s for sure, but they make all the other weapons sound like pea shooters. To recap, we got four new maps, two new game modes, two new weapons, some new dog tags, and a few new achievements/trophies thrown in. As you can see, The Lost Island DLC is a fairly generic map pack that doesn’t do anything out of the ordinary, other than re-animate memorable Crysis locations in a shiny new wrapper. For that, I don’t think the the $14.99 price tag is very reasonable. In an ideal world, Crytek would have thrown in The Lost Island for free. Truthfully, it actually would have fixed some major issues that currently plague Crysis 3. The Lost Island playlist is actually made up fewer game modes on older, vanilla maps, in addition to the four new maps. That means that if everyone owned this DLC, we’d all be playing on all the maps (including the new ones which are really good) with a more focused selection of game modes. 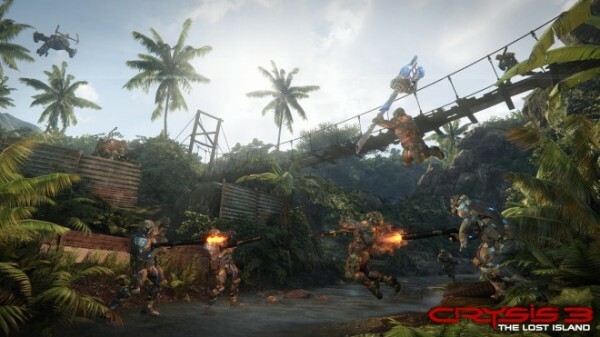 Personally, even though I’ve already paid the money for it, I’m at the point where I would not be upset if Crytek and EA had a change of heart, re-released The Lost Island for free, and unified the entire Crysis community once again with a better selection of maps and playlists. BioWare did it with Mass Effect 3, releasing multiplayer DLC for free while charging for single player DLC, and it damn well worked. Everyone was happy. If Crytek wants to revive a dying Crysis 3, extend the campaign with some paid single player DLC, but keep the fragile multiplayer community together with free multiplayer DLC. This. I want this, but as single player DLC! When it comes down to it, as a piece of DLC for a shooter like Crysis 3, The Lost Island is, indeed, pretty good. While the new weapons don’t add much, the maps are fun and the new game modes really focus the action so that you’re always finding your way into a gun fight. It definitely and clearly improves the game as a whole. But sadly, considering the lack of community currently backing this game and the price tag of $14.99 USD, I can’t recommend The Lost Island to anyone. If you got that sort of money to throw at it and manage to find others who’ve done the same, then you probably won’t be disappointed. I give The Lost Island DLC itself a 3 out of 5 stars, but If I was to rate how strongly I recommend you buy it, consider it nil.